I had the most amazing experience a few weeks ago. a few days into Victorian bliss. Erin and Jeremy. They were beyond wonderful. To visit a link to their website click HERE. of each establishment. It was quite a feast for the senses! Christmas spirit and we enjoyed the weekend very much. We both needed to escape the hustle and bustle! score the recipe for us, THANKS KIM!!! Good friends, Good memories!! Thanks Guys!! Spoon sherbet into punch bowl. sugar dissolves. Add raspberries, still until raspberries separate. Slowly add carbonated beverage. with Earl Grey Syrup to go with these yummy drinks? I made these especially for our hostess, Wanda Lee!! For a printable recipe for the waffles click HERE. For a printable recipe for the Earl Grey Syrup click HERE. and Giveaway I am hosting - click HERE!! the Tea Party this week, so make sure to link up below. Thanks for hosting! All of the photos look beautiful. The punch sounds so refreshing too! The waffles and tea look delish! Have a great Tea Party Tuesday! Wow - looks like a wonderful weekend. I am glad you enjoyed it :) I think I will be making that punch soon. Thanks for hosting! How beautiful to go for a weekend to such a wonderful place like that! So glad you had a great time. Thanks for the holiday punch recipe and for hosting such a nice tea party. Trisha, it sounds like you and your hubby had a splendid time at the B&B. It looks charming. The gingerbread waffles look good. Leave it to you to serve something delightfully interesting. Thanks for sharing and I hope you're having a wonderful week. Looks like a lovely visit! Thanks for hosting! Trish - What wonders are coming from your kitchen!! I have enjoyed scrolling through your recent posts - Grinch Pills? Genius! And this B&B post is too scrumptious! Boy - could I use a getaway like that about now! Thanks so much for sharing some of the beauty with us - and all your sweets, too - so inspiring! How wonderful that you were able to go for a Victorian holiday break. We have a Victorian seaport town nearby and have gone for their Victorian weekend. Such fun! The recipe looks delicious! Thanks for sharing your break with us. The mansion is so enchanting and I can imagine how you must have felt like you were in another world. The waffles look delicious and I love your little cookies tucked inside the teacup. that all looks like an Victorian heaven to me. I can imagine wbhat a special treat it was to stay in that beautiful house. Thank you so much for sharing this delight. awww you and hubby look lovely! and the B&B place is just beautiful! what a gorgeous place to stay and i love raspberry punch so i just got to print out the recipe as well as the gingerbread waffles, yumm! the christmas tree and the table setting in the photos look wonderful! glad you enjoyed your stay there! A progressive tea ... I bet that was loads of fun! Gingerbread waffles ... YUM!!!!! I know you enjoyed the B&B. Happy Tea Day! Oh my!..,Your Ginger bread waffles with Earl Grey syrup look so yummy and simply divine! 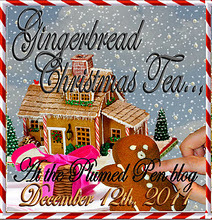 Thanks ever so much for joining me for our Gingerbread Christmas Tea party! It has truly been a marathon of grace growing, patience producing, proportions for me in blogland these days Trisha. What I fear may well look like carelessness, indifference, and time mismanagement. Is in fact, (God being my witness), is actually quite the opposite. ..,In fact in truth, and also in my dear husbands heart and mind, I have actually been spending a shockingly untold series hours of labor on end, with a very slow at times completely unresponsive and ailing computer. Thank God it is much improved after much TLC and extensive repairs, so better days ahead I hope! ~ When I fix Silken Purse's blog post, (because last night The computer just slowed to a crawl and refused to up load and kept freezing); so instead of risking another computer crash, I simply gave up and had to shut it down at 7:30 a.m.
Oh well! I shall be back to link up my other blog later dear lady. Back in spirits, 'much merrier and much brighter'.., Aaah!.., A sigh of relief; I have thank God prevailed,( and after well over twelve hours and counting), 'Silken Purse' blog post is in full Christmas party mode, despite my computer. Gingerbread waffles? Wouldn't those be a fine way to start a day! Très yummy! Off to visit some of the contributors ~ everything looks so delish. I've been in the midst of cabinets being painted and everything is topsy turvy. Sounds like you two had a wonderful and romantic getaway. Gingerbread waffles, Mmm, you make the best things for tea! it looks amazing there, sound like a wonderful trip and a perfect getaway. 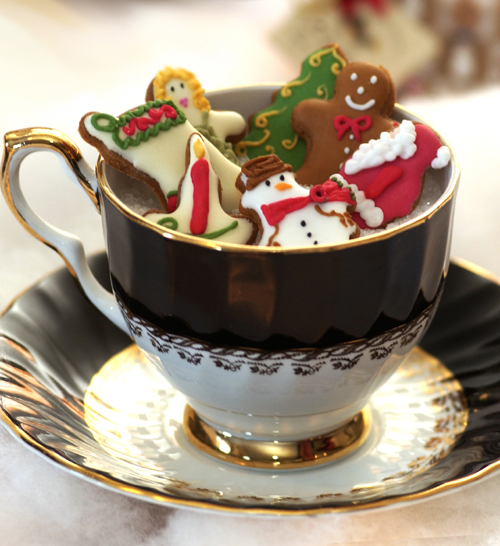 I love gingerbread, it is perfect with the tea. We have been to Stillwater in the summer, but I would love to take that tour. The raspberry punch looks delicious. 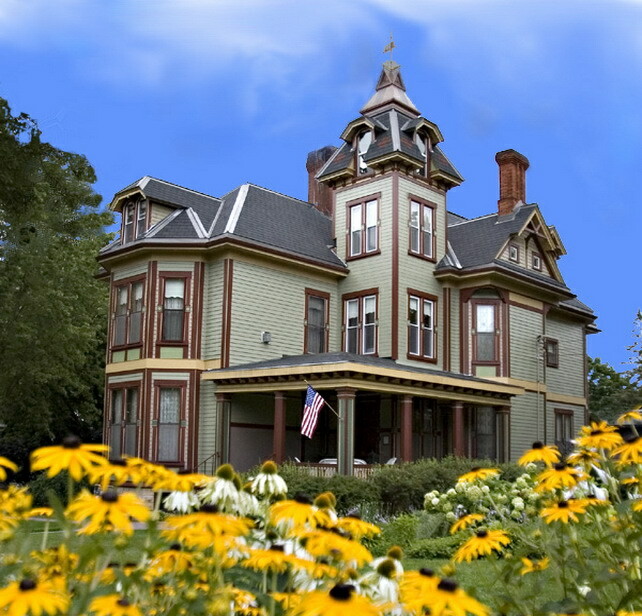 How nice that you could get away to such a special b&b...the progressive holiday event sounds wonderful! We had a magical time too Trish! Thank you for sharing a special weekend away, you guys are so dear to us! Thanks for sharing these lovely photos!! What a wonderful treat. Nothing like a little getaway to recharge. I may make the punch for Xmas eve - I think the kiddos would really like it. Such a beautiful site, Trish! I love coming here and seeing all the beautiful "eye candy." 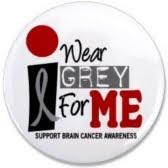 I will be visiting often and posting your button to my site. Take care and Merry Christmas! 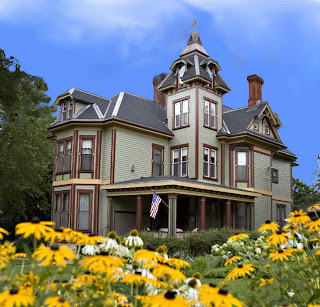 What a gorgeous Bed and Breakfast! I'm glad you and your hubby had such a wonderful time relaxing and being spoiled there. Your waffles look fantastic and I'm really intrigued to know what Earl Grey syrup would taste like! What a lovely place to unwind in!! I really enjoyed your post.Special memories for you and your hubby.Have a lovely Christmas. Oh Trisha, you are so lucky to go to such a fab B and B with your hubby! It looks divine. Your OCR tea cup and saucer are gorgeous too! Thank you so much for sharing your holiday trip with us all. This meme has been added to the list of Tuesday food linkies at Link Rink.